Moniker Estates is comprised of three generations that share a passion for crafting exceptionally bold, rich wines from some of the best fruit in Mendocino County. As a new Luxury wine, with a mysterious name, Moniker enlisted Auston Design Group to create a restrained and iconic brand. The Moniker Brandmark is an interlocking M and a triangle; M for Moniker, and the triangle to symbolize three generations of family viticulture and winemaking behind the brand. The charge behind the design was to present a modern package that paid homage to the family history but also conveyed a hip and urban feel that would appeal to a younger, sophisticated wine buyer. As usual, we are very pleased with the print quality from CCL Label of Sonoma. This was some very interesting printing from a technical standpoint. The entire brandmark was hot stamped in silver foil, then overprinted with three different translucent ink colors to give the effect of three shades of metallic leaf. Along with the expert craftsmen at DeCreval Die, in Napa, we created a tricky emboss die to enhance the effect of interlocking elements. The label was printed on an uncoated substrate with a Swiss made, Gallus RCS 430 press, with an in-line Rhino flat stamp embossing unit. Legendary rap artist, E-40 (aka Earl Stevens), entrusted Auston Design Group with the creation of the brand identity and packaging for his new line of wines. Earl has been a wine aficionado since his early days in the recording business; a career spanning twenty years. It wasn’t until recently that he decided to develop his own brand, Earl Stevens Selections. The label design is intentionally very traditional. Earl Stevens wanted to steer clear from any gimmickry that played off his celebrity so that the wine was appreciated as a quality product in its own right. Any nods toward his music and lyrics are subtly hidden within the label, such as “707" and “Northern California”, both representative of where he grew up and often referenced in the lyrics of his songs. Since its October 2013 release, the brand has garnered a lot of positive press. It has gained broad consumer appeal, showing quick and steady growth. 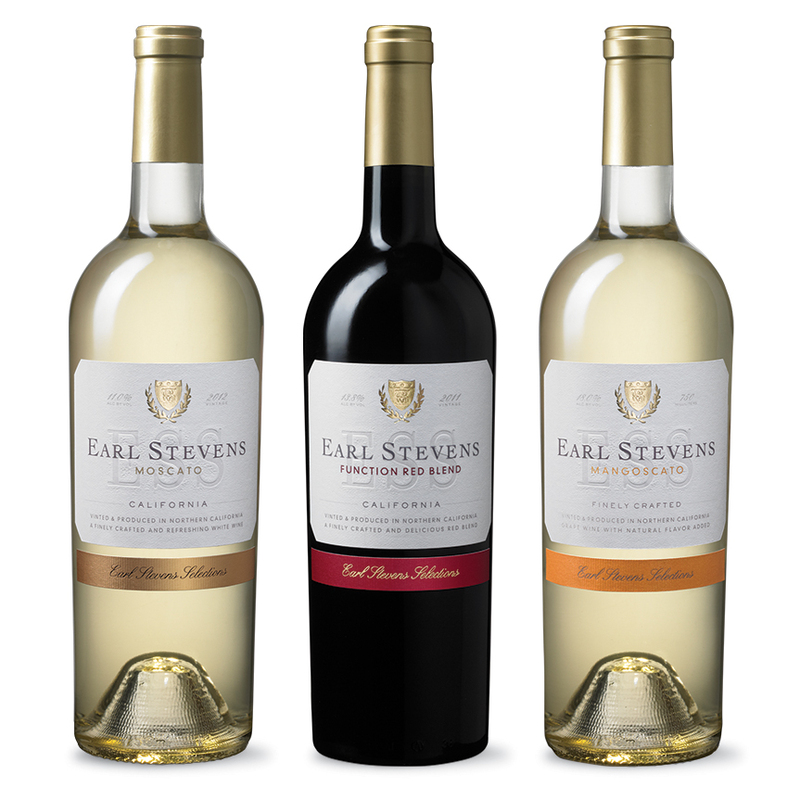 Distributed by Southern Wine & Spirits, Earl Stevens Selections is widely distributed throughout California; including Costco, and all Northern California BevMo locations. It’s no secret that musical artists are often engaged to endorse and promote existing alcohol brands, but few can say they have created a successful brand from the ground up, or have the credibility to do so. Earl is a world-class promoter and has fully embraced the use of his music and social media, not only to get the word out to his wine loving fans, but also to introduce an often overlooked market demographic to the enjoyment of a nice glass, or two, of Earl Stevens Selections. The label was printed at Metro Label, Napa, CA, on their Belgian Xeikon 3500 digital press, with offline gold foil stamp and emboss/deboss on their Swiss made Digitt Rhino finishing unit. ¡ Feliz Dia de los Muertos, from your Amigos at Auston Design Group ! We've chosen this sacred day of the celebration of the lives of the dead to launch our first ever spirit, Horchata Spiced Rum. Our recipe is based on the flavors of Horchata, a traditional non-alcoholic rice milk drink of Mexico. Infused with Cinnamon and Vanilla as the dominant spices, it is crafted to be mixed with a sweetened milk of any kind and served on the rocks. It can be enjoyed equally well in any spiced rum cocktail. The artwork for our package design represents the blending of two cultures, Mexican, and that of the indigenous peoples of Mexico and the southwestern United States. This variation on the traditional Sugar Skull of Mexican culture depicts our interpretation of a Bruja (witch) from the culture of the indigenous peoples. The characters flanking the Bruja are her minions. The amber apothecary bottles were masterfully screen printed by Movera Glass Decor, of Point Richmond, California, utilizing a unique process that allows them to print a 360º image, as-well-as allowing that image to continue above the straight part of a bottle and onto the shoulder. Each bottle was then hand dipped in black wax to seal the closure. Subterra: Wines From the Underground. Wines so obscure and esoteric that you just can't purchase them unless you know somebody that nobody knows. All kidding aside, It's a real wine made by two up and coming local winemakers who were born and raised amidst the vines and wineries of Sonoma. Their wine is an expression of what it means to be an artisan brand. Made from a single vineyard in extremely small quantities, it is a real handcrafted, small-lot wine. 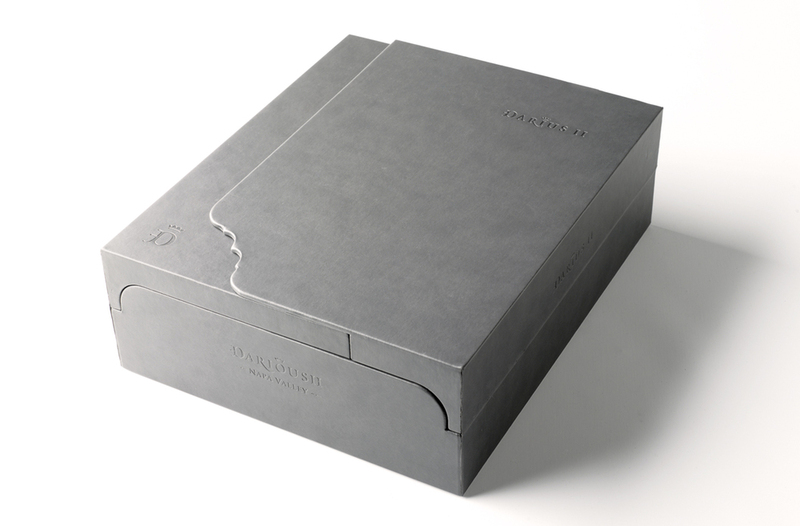 Our restrained approach to the packaging was to present the brand as standout and clever. A label that can be different, because the product really is that good. Targeted to folks who really know wine. The main graphic represents just how "subterra" these guys really are: "Wines from the Underground." The gloss black on gray brandmark is there just in case you didn't already know the brand. Insider tip: try to get your hands on this before it's gone. The label was expertly printed at the new CCL Label plant in Sonoma, California. Each bottle was hand-dipped in wax and then stamped on top with a hot die. Darius II is the crown jewel of Darioush Winery's portfolio of über premium wines. Each vintage presents a new piece of pre-muslim, Persian art to adorn the label. The quality and precision of this art, some of it well over 2000 years old, is nothing less than amazing. The creation of the pressure-sensitive paper label for the 750ml. bottles is our first priority. Auston Design Group works very closely with our favorite die maker, DeCreval Dies, of Napa, CA, to create the highly detailed emboss and/or deboss dies. The labels are then masterfully printed and finished by Collotype Label, also of Napa. The three and six liter large-format bottle designs are based on the look and feel of the paper label. Some modifications are often necessary to accommodate the process. Napa based, Etched Images, etches and hand-paints each bottle. While very similar, no two are exactly alike and the final product is next to impossible to walk past without touching it. There is a new craft distillery in Northern California. Humboldt Distillery launched its first product, a Certified Organic Vodka, in May 2013. Auston Design Group was pleased to have been selected to develop the branding and create the packaging design for this new entry into the smoking hot, Craft Spirits genre. The Distillery, located in the city of Fortuna, on California’s rugged North Coast, wanted their brand image to reflect the coastal essence of Humboldt County. While Redwood trees, rocky shorelines and chainsaw art, were expected directions to take, we found out that the Master Distiller had a love for Crabbing the local waters and felt that the Dungeness crab would be the perfect icon to represent a Humboldt County distillery. He couldn’t have agreed more. Once we got the go ahead we were able to use creative copywriting to explain the somewhat unexpected choice of a crab as the brand's Icon. The distillery will be releasing Raspberry and Orange Blossom line extensions in the coming months. Stay tuned! The labels were digitally printed at Vintage 99 Label in Livermore, California. The hard working Gnarly Head wine label, originally designed by Auston Design Group in 2003, helped propel this powerhouse brand toward becoming the #1 selling Zinfandel brand in the world. Not wanting to sit on its laurels, and with continued growth in mind, DFV Wines hired ADG to evolve the design with the goal of increasing sales through strengthened shelf presence, and by making the original “Old Vine Zinfandel” label design work better with other varietals; most importantly, white wines. Changing the label design of such a wildly successful brand as Gnarly Head is tricky business. The intent was to increase perceived value with existing consumers and to insight trial with consumers who are not currently Gnarly Head drinkers. It was imperative that the core equity elements of the package be maintained. Any adjustments to the brandmark, illustration and color scheme had to be done with such subtlety that the average consumer might not notice that something had changed. A big part of the success of the original package was a somewhat crude, unpolished look that appealed to consumers. We call it “The Funk Factor”. The funk factor was another key element of the original design that had to be maintained and represented in the new design. Our client, and we, believe we have achieved these goals and watch closely as this new design continues to filter-in on store shelves across the globe. We are very pleased with the top quality reproduction of our artwork. The labels were printed on the state of the art Gallus EM 410 S flexographic printing press. A special thanks to Mark Grigsby of Grigsby Label in Eldorado Hills, CA. for seeing the job through. Raff Distillerie, San Francisco’s newest distillery, is located on Treasure Island where it produces high-quality, small-batch spirits. Auston Design Group developed branding for the distillery, and package design for its Bummer & Lazarus Gin and its Emperor Norton Absinthe. Both brands are based on mid to late 1800’s Barbary Coast characters of historical significance. The package designs are meant to reflect the mood of the characters and the era. Emperor Norton: Norton was a successful San Francisco businessman who, after some bad investments, lost his fortune. A few years later, apparently mentally unbalanced, he proclaimed himself "Emperor of these United States" and "Protector of Mexico". Though he was considered insane, or at least incredibly eccentric, the citizens of San Francisco celebrated his regal presence and his proclamations; most famously, his "order" that the United States Congress be dissolved by force, and his numerous decrees calling for a bridge to span the bay, connecting San Francisco to Oakland. He was treated deferentially in San Francisco, and currency issued in his name was honored in the establishments he frequented. Norton died in 1880. Nearly 30,000 people packed the streets of San Francisco to pay homage to him. Absinthe is a fitting homage to his legacy. Bummer & Lazarus: Bummer and Lazarus were two stray dogs that roamed the streets of San Francisco in the early 1860s, and were embraced by the city’s citizens. Recognized for their unique bond and their prodigious rat-killing ability, they became a fixture of city newspapers and were exempted from local leash and muzzle laws. This unique Gin package is a nod to an overlooked part of San Francisco history. Special thanks to Jay Tapp and the crew at Metro Label for masterfully reproducing our designs on their Xeikon 3500 digital printing press. The Digitt finishing system was the icing on the cake with amazing emboss and deboss effects. Auston Design Group teamed up with Bronze Creative to develop the branding for this new entry into the rapidly growing specialty rum category. Marauda, Spanish for marauder, is in reference to the rum loving pirates that prowled the Caribbean Sea in the 18th and 19th centuries. The brand is targeted to aspirational consumers who have cut their teeth on lower quality rums and are looking to experience a higher quality and more mature product. The package design combines custom bottles, screen-printing and pressure sensitive labels. Lot numbers, along with sequentially numbered bottles from each batch, reinforce the hand-crafted, small-batch nature of this rum. A limited production wax-dipped launch bottle was created as an introduction gift to distributors and key accounts. International Beer Week (2/10 – 2/19) was the perfect time for Sierra Nevada to introduce the extension of Pale Ale as its first foray into cans. Auston Design Group has been working with the creative department at the brewery for the past year to extend the Pale Ale branding to cans and the twelve-pack carton. Sierra Nevada saw the expansion to cans as a great opportunity to make the Pale Ale more portable. Auston Design Group was asked to explore a broad range of solutions, ranging from very close in, to radical departures from the existing look and feel of the brand. A collection of the strongest of these concepts was put before focus groups. After much thought and consideration based on the learnings from the focus groups, as-well-as gut instinct, the brewery chose to stay true to the current Sierra Nevada Pale Ale graphics. We are proud to have been a part of this expansion, and are excited to enjoy these pale ale's in the wild. Einstök Doppelbock is a limited-edition seasonal release that provides the ideal ale for celebrating the holidays. Malted barley, notes of chocolate and caramel sweetness make this the perfect ale to go along with most hardy winter fare. Because of the limited-edition nature of the product, Auston Design Group, took a lighter approach to the label design and had a little fun with our badass viking, because after all, it is beer and beer should be fun...right? Einstök Doppelbock is available at Harvey Nicols, in the UK and in liquor stores across Iceland. With its highly anticipated launch at Harvey Nichols, London last month, Einstök represents the first Icelandic craft beer brand to be exported from the island nation. The new brand has been received with much excitement by consumers, as-well-as the trade. There is a strong curiosity surrounding Iceland’s first craft beers, and we are happy to report that they are receiving positive reviews. The brand is slated to hit the U.S. market in the first months of 2012. Einstök is an Icelandic word meaning “unique”, which is fitting as the country was originally settled by Vikings and rests on the edge of the Arctic Circle. Like other northern European countries that endure long hard winters shrouded in darkness, the Icelandic culture is earnest and efficient. This characteristic is evidenced in their history of a clean and minimal approach to design. The Einstök branding and label design are an effective representation of this northern European mind-set. The bold sparseness of the package lends itself to strong billboarding on shelf, which makes it stand out like a beacon in the highly competitive beer aisle. Einstök is distributed in the UK by Love Drinks, London. The beer labels were expertly reproduced by Guidotti Centro Stampa in Lucca, Italy. The simple design is very cost efficient to print with only 2 to 3 colors per label. After completing the wine label design, Auston Design Group provided structural and graphic design for luxury cases that house Darioush Winery’s most revered and exclusive wine, Darius II Cabernet Sauvignon. The subtle and minimalist design reinforces the ultra luxury status of this tier and evokes the very essence of Darioush Winery’s brand image: chic, sophisticated, and understated – the epitome of elegance. The cases were beautifully produced via Influence Communications, a specialty printing, packaging and POS company based in beautiful Oakland, California. Our thanks to Chris Hundley and Bill Brown for maintaining the highest standards and helping us see the project through to fruition. Every now and then a great project with a great cause finds its way to our door, and most recently it was Heslet Honey Co. of San Francisco. Because we believe in the cause and appreciate the forward thinking and dedication of beekeeper, Kate McGee, we took on the branding and packaging of this start up on a pro bono basis. Heslet Honey is comprised of two beehives located on the lush and verdant east facing slope of San Francisco’s Telegraph Hill. 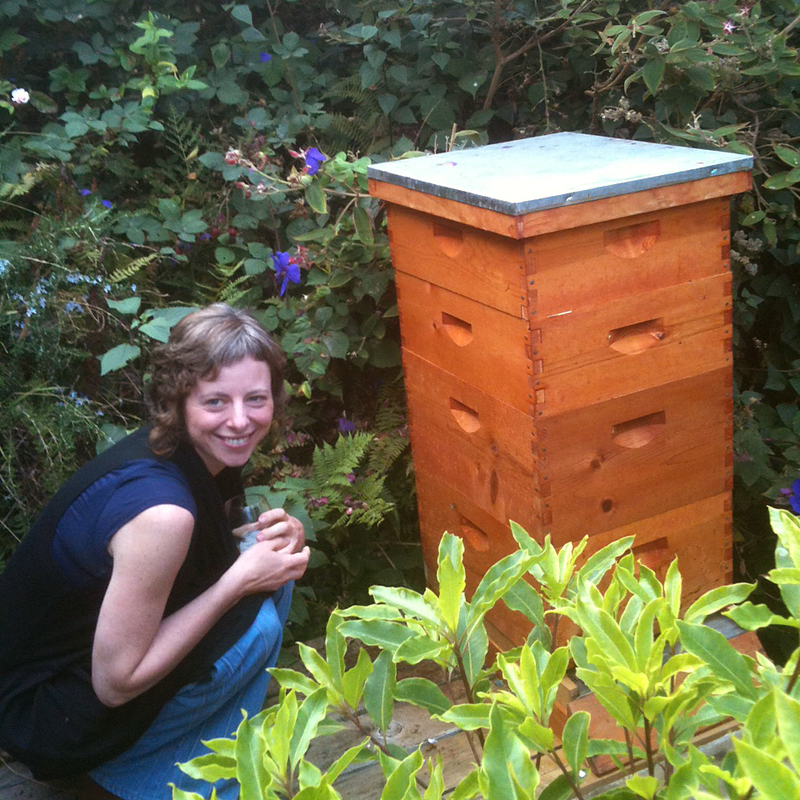 Kate tends the hives, harvests and hand crushes the honey, strains, packages and sells it… this is a truly handcrafted product. Our approach to branding this honey was to take great care in not over designing or over packaging it. The somewhat home-spun and vintage look of the label is intended to reflect the design aesthetics of the 1940’s, when the brand’s namesake, Valetta Heslet and her mother, transformed Telegraph Hill’s public right of ways from garbage dumps to beautiful gardens. The master label art is black on white and set up to be photocopied to craft paper. It is hand trimmed and applied with a glue stick. Visit heslethoney.com to learn more about this important pilot program that utilizes public right-of-ways to provide urban agriculture in the city. Bee Keeper, Kate McGee, at her hive in the Greenwich Street right-of-way. New Pinot-centric brand, Bailiwick, just finished its maiden printing and is looking delicious. Their only white wine is a California Vermentino (shown below with the four Pinot's during printing QC at the press check). The concept features a venn diagram of overlapping circles. Each circle represents the strength and experience each of the two owners, brothers Paul & Bryan Vais, bring to this new enterprise. Where the circles overlap represents the strength of the partnership, their Bailiwick. There is a different color combination for each of the four Pinot Noirs produced by Bailiwick Wine Co. The labels were beautifully printed by label printers, Tapp Technologies, in their new Napa plant. They were digitally reproduced on their HP digital off-set press, and finished off-line with an embossed texture and debossed brandmark. Thanks to Cameo Crafts of Sonoma for doing an amazing job with the pre-press and the printing of this label. This was not an easy one to print with 4 color process, 3 spot colors, emboss, deboss and a persnickety designer on press.